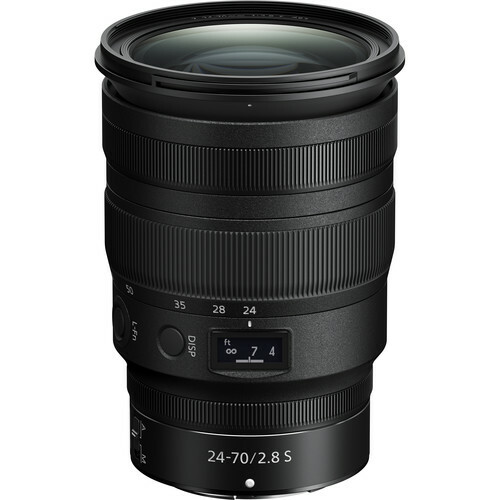 The Nikon Z 24-70mm f2.8 S is a general-purpose zoom designed for Nikon’s full-frame Z-series mirrorless cameras and aimed at professional photographers. The first native zoom in the Z series with an f2.8 focal ratio, the Z 24-70mm f2.8 S dispenses with the retracting barrel of the f4 models for a more traditional appearance, but becomes the first with a dedicated manual focusing ring in addition to a separate custom ring, as well as a customisable function button and an OLED display, the latter indicating focal length, aperture, focusing distance and depth-of-field in a similar way to the Zeiss Batis lenses. The lens itself is inevitably heftier than the f4 version in the range, but manages to be shorter and lighter than its Nikkor DSLR equivalent thanks to a new optical design. You can read the full review at Cameralabs.